21 September and can I get some sleep please? In the last 24 hours, there have been a few teething problems with the viewing of the webcam on Africam, and the live chat facility on Ustream. I'm happy to report that everything is fixed and (hopefully) will run smoothly from now on. I tried getting on to the chat yesterday but had problems too. 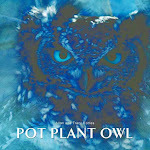 Pot Plant Owl looks quite content in her pot plant. She is completely unfaxed by her Starling visitors who come in and steal her feathers for their nest (the loose feathers, that is).I hope the Starlings and other birds realise that PPO's calm attitude around them will not be for long. As soon as the chicks arrive and there are plenty of hungry mouths to feed, PPO will be looking at these birds differently. For now, it is great to see everyone living in harmony. Tracy, you have an extra "p" in potted in the link so it does NOT work. So great to be watching again :)Way latchy as i only discovered you were back today!